I came across an old post by Krya relating to the Kabbala, I would like to add to it in both an informative way and a basis for study for those ho are interested. “The Pythagorean idea of the creative powers of numbers and letters, upon which the ‘Sefer Yetzirah’ is founded, and which was known in tannaitic time is proved to be an old Kabalistic conception. The word Quabala comes from the Hebrew word Qoph Beth Lamed…...to receive. The mysteries are received and cannot be taught. 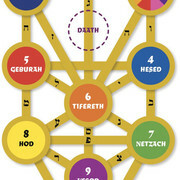 The Qabalistic tree of life has 10 spheres, 22 paths and 3 pillars. The pillars from left to right are 1 feminine, severity, form, restriction. 2 middle, mildness, Equilibrium, balance. 3 masculine, mercy, force, expansion. 1 ( top centre) I am that which is attained at the end of desire. Attributes; colour – brilliant white. Said to be totally positive. This is the first move, not manifestation, but that which causes manifestation. Before Kether there was nothing. Kether is an idea, here is the Creator Spirit, a reunion with the source of all being, a union with God. 2 (top of right pillar) I have been with thee from the beginning. Idea of force, spiritual force, the ultimate positive, fertility, God. Associated name – JHVA Yahveh…Lord. Angels – AUPHANIM, the wheels (seen by Eziekiel? ), Archangel in charge RATZKIEL. Magical figure, old bearded man. Chokmah is half of the first pair on the tree, and the pair must be considered together. 3 (top left pillar, opposite Chokmah). Listen to the words of the great mother. Without Binah there can be no form, or forms. Saturn is the restrictor, or resistance. Resistance creates form. Deity, the great Mother Goddess, Ceredwen. Illusion – Death, just an illusion as we are immortal, but as Binah is followed by Chomak (going up the tree) which is force without form then this could be viewed as the sphere of ascension, or birth. Spiritual experience – great sorrow, a sorrow almost too great to bear, sorrow is a great teacher, and so we are given the strength to overcome this time. Angels – ARALIM (the thrones) they are the source of the strength we are given in times of sorrow and testing. Archangel in charge – TZAFKIEL, the keeper of Akashic records, he records all our deeds, good and bad. Also the archangel of the Archetypal Temple. (created of harmony, music, etc). Alternate titles; Ama & Aima. Ama = dark sterile mother, Aima = bright fertile mother. Ama receives us as we move on to the death of self and onto higher realms. Aima gives us birth into the physical realms. The above 3 spheres are known as the supernal triangle and they represent potential. 4 (second on the pillar of force, or male pillar, below Chockmah). There shall ye assemble. This is the Hall of the Masters, or Adepts. It is a place where some stop to help others or themselves, also called the Ascended Masters. This is a sphere that can provide help in difficulties. This is the sphere of order, the first cohesion of force affected by form, on a a subtle archetypal level. Adeptus exemptus….. those reaching this level are given this title as they may now be exempt from the wheel of life and future reincarnations. Vice bigotry, hypocrisy, tyranny, or any corruption of power. 5 (second on the female pillar, below Binah) And ye shall be free. GEBURAH. Might, power, strength, judgement, fear or awe. The actions of Geburah can be difficult but it is not a malefic sphere. It is through hardship and difficulties that we grow and develop. An easy life is of no help. Magical limage. A mighty warrior in his chariot. Gebura defends and punishes. There is a balance between these 2 spheres as the guidance of Chesed compliments the punishment of Gebura. Gebura represents the breaking down of form, destruction. The sacrifice of form for energy. Gods. The ‘Smith’ Gods, Brigid, Vulcan. This is the Hall of Karma. The Hall of Judgement. Here we are divested of useless baggage by the energies of Geburah. Spiritual experience. Vision of power. Name of power. Elohim Gibor. Almighty ones. Archangel. Khamiel. The defender of the weak, avenger of the wronged. He leads the Seraphim, or the Fiery Serpents. Chesed expands, Geburah restricts, let there be power and compassionall 5 sided figures symbolise this sphere. Unbalanced mercy is weakness, and the fading away of will. Unbalanced severity is cruelty and the barrenness of mind. 6(centre of the tree, in the middle of the centre pillar, below Kether). Let there be beauty. TIFERETH. Balance between severity and mercy, force and form, active and passive, equilibrium. The child of the God and the Goddess. Tifereth is placed at the heart of the tree. Esoteric tradition states that the power of our sun comes from another sun, so it is here, Tifereth, The Lesser Countenance, reflects the power of the greater sun, Kether, The Greater Countenance. Two aspects, death and rebirth. Here are the sacrificial kings, Llew, Osiris, and the sacred children, Lugh, Jesus. Horus. Light and healing. The healing Gods and the lightbearers are also found here. Spiritual experience. Vision of harmony & understanding the mysteries of sacrifice. Magical image. 1 a King. 2 a child. 3 a sacrificed god. Archangel. Michael (sun or fire) or Raphael (healing). Name of power. Yarvey Eloah Va Daath. God/dess made manifest in the sphere of the mind. Vice. False pride, lack of humility. Illusion. Identification. Identifying yourself by what you do, not who you are. Briatic correspondence. Wholeness or centality. 7(bottom of the right pillar of force, below Chesed) For behold all acts of live and pleasure are my rituals. Angels; the Elohim, angels not gods, but trepresent the energy of the God/dess. Here the deity energy is broken down into the male and female, the God and the Goddess to fit images we are familiar with. Netzach acts as a prism which divides light into rainbow colours. Spiritual experience. Vision of beauty triumphant. Name of power; YAHVEH TZABOATH. Out of the one, many. Netzach is energy, creative energy, the energy put into rituals to make them effective. This is the spark of genius, the energy you feel when writing a ritual. Use your artistic side to experience Netzach, paint, write, just for fun and see how things change. Make contacts through creativity. 8(bottom of female pillar, below Gebura, and across the 27th path from Netzach) To these shall I teach that which is yet unknown. Sphere of the intellect, science and teaching. Planet; mercury Receives the most light from the sun. Angels; Beni Elohim (translates as the children of the God/dess) Forms of the Energies represented by the Elohim, Angels of Netzach. (These are not illusionary or transient thought images as those of Yesod, they are Telesmic, that is one that has been imbued with special qualities and a permanence due to hundreds of years of use). Michael is a defender on the psychic planes and Raphael is a healer of psychic wounds. Striving for knowledge can place us in danger. Spiritual Experience; Vision of Splendour. (touches the mind in the same way the Vision of Beauty Triumphant touches the heart). Magical Image; Hermaphrodite. ( the spheres of Hod and Netzach are closest to physical manifestation, and at the bases of the male and female pillars shows the duality of the sexes without being either). Here the female fertilises the male and the male mind creates form for the female soul. Hod is the text for ritual magic whereas Netzach is that of natural magic. Hod is the form and Netzach the energy. 9 (centre pillar below Tifereth) And the white moon amongst the stars. Foundation, the sphere that precedes physical being, it is the sphere that is mostb easily reached from physical manifestation. Name of Power; Shaddai El Chai. Almighty and living God. Akasha, or the Astral or Etheric planes. It is here that we build our thought forms, or their images, here they are just images until energy enters them. They can be misleading and can lead one astray as they can appear to be the real thing. Deities; Astarte, Ceredwen, Hecate, Diana, all moon goddesses. The Triple Goddess, always constant but not always visible. Yesod is the sexual and fertility plane. Here souls enter the bodies created for them. Last step before physical manifestation and last step after it. Gabriel and his angels, or guide spirits guide thew souls into the bodies, and after the physical manifestation is over, guide the souls home again. They are in charge of arranging or designing the forms which manifest in Malkuth, the physical plane, but the forces that hold it together and give it life are Yesodic forces. This is the place we would find ourselves after the death of the body, but that is only one death, we must also suffer the death of the personality, or who we are in this life, that happens in Binah, as we travel back up the tree on our way to our next life. Magical image; Naked man, strong and powerful. He represents the potential and the fertility of this sphere. 10 (bottom of the centre pillar, at the end of the 32nd path between Yesod and Malkuth). I am the beauty of the green earth. The Kingdom, also the Gates of Death. Said to be totally feminine, receptive to all other spheres. Deities; all Earth Gods, Cedrnunas, Pan, etc. Symbol of the 32nd path is Saturn, the planetary attribution of Binah, the idea of Form. Magical Image; A young Queen, crowned and on a throne. Name of power; Adonai Ha Aretz, Lord of Earth. People who have had NDEs report having seen, or travelled along a dark tunnel, this fits the symbology of the 32nd path from the physical sphere of Malkuth to Yesod. All spheres are equally holy or divine, and all ideas, potentialities, come together in Malkuth, this is the physical, and for some the only reality. The energy flows down the tree from Kether, is made manifest in Malkuth, then flows back up the tree to Kether. A text from the Sepher Yetzira has the tree the other way up, so its roots are in heaven and its branches in the earth. The text reads; The tenth path is the Resplendent Intelligence, because it is exalted above every head and sits on the throne of Binah. This establishes Malkuth at the top of the tree, and expresses the Goddess in the physical world, and therefore its divinity. ‘As above, so below’, so if Kether is holy, so is Malkuth. We have travelled down the tree from pre-being to being, now we travel back up to Kether after having learned, and gained knowledge, and we will return somewhat more than when we left. We reach from this physical life to our source. Magical Vision; The Holy Guardian Angel. This is your inner self, your greater being, of which you are a part, the bright being radiating love which many have reported seeing in NDEs. I have often come across works referencing the Kabbala but must admit, I had no idea of what it really was. This thread is extremely informative and has piqued quite the interest in me. I will definitely be looking more into this. Thanks so much @johngefnir.